The Spyderco Civilin knife was developed firstly for U.S. law enforcement special undercover agents. 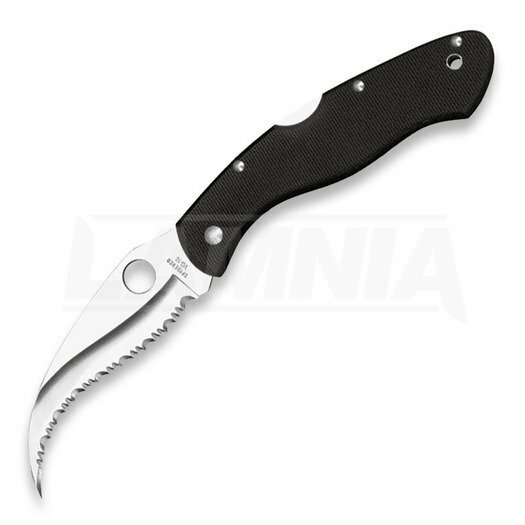 The Civilian has a patented reverse "S" blade that's intended to be used like an oversized claw. The tip is ground to an ultra-thin profile. Deeply curved and full at the belly, the VG-10 ground blade excels in slicing and is available fully SpyderEdged. Because of its distinctly specialized features it is not intended or designed for general utility or everyday use. Curved in all the right places for ergonomic use and retention of the knife, the handle is black G-10. A two position clip supports discreet tip-up or tip down carry on the right side.